Delegation, Disability & Disney. Here at Forward Ladies, we’re passionate about women doing great things in business – and passionate about sharing the stories of those women, both to celebrate their success and to help inspire others to pursue their dreams and ambitions. Please tell us a little bit about your background. I am the newly promoted MD of Talk Direct, a franchise of O2. We have 16 retail stores in Yorkshire and the North East area as well as our own call centre. My career background has predominantly been in the corporate world, and I’m very fortunate to have been able to work for two blue-chip companies, Microsoft and O2. I’m incredibly passionate about my job and absolutely adore the people I work with! I lived in Hong Kong when I was a young girl and speak fluent Cantonese. I’m married with two beautiful daughters. Also, I am a massive Disney fan, and I’ve been there a total of 11 times! You’ve grown Talk Direct Leeds Ltd from 4 to 16 stores in only five years – what has been your greatest challenge during this time? 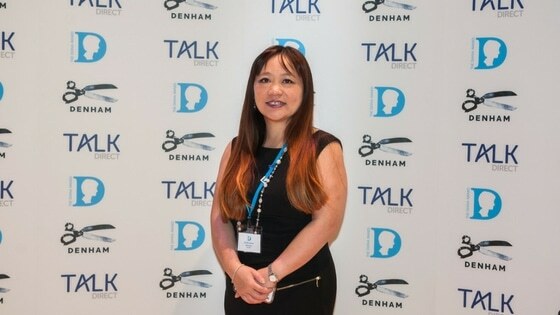 One of the most significant challenges I faced when I first joined Talk Direct was to change the culture, as it was a very male-dominated environment. Everyone was under the impression that you had to work seven days a week to prove that you were working hard. I found this very strange, and I was keen not to follow but instead show that it was possible to work hard and have a good work/life balance. I demonstrated my delegation skills and empowered the team to turn their ideas into reality. What is your greatest achievement in your career so far? My greatest achievement is watching my team grow and blossom in their career journeys. I’m able to see how they have transformed into better versions of themselves and how their hard work has paid off. I’m very proud of them all. I’m also immensely proud of the creation of Project iCare. Project iCare was created when Talk Direct employee Mark Skelton was sadly registered blind following the complete loss of sight in his right eye and 80% loss in his left eye, due to diabetes. Mark came to me and Zak Patel (Talk Direct’s chairman) to tell us he could no longer fulfil his role of Assistant Store Leader due to his disability. However, we identified an opportunity for Mark and created a new position for him. Mark now uses the technology accessibility functions of mobile phones/tablets to help other registered blind users to make the most of their technology. When we started this journey with Mark, we had a blank canvas and didn’t know where to start, but after coaching him and meeting several visual impairment charities and communities, we have been successful in helping hundreds of customers using the accessibility features of mobile phones and tablets, and reaching out to hundreds more. This project is very close to my heart, and Mark isn’t just doing his job, he has gone above and beyond to make life easier and more sociable for the blind community, turning his disability into a capability. One of the biggest risks I’ve ever taken at Talk Direct was to convince our teams that customer service is just as crucial as getting the sale. Talk Direct was very famous for being a sales driven organisation. We would hit all the sales targets, but we were missing the caring customer service aspect of our sales. I had to work extremely hard to convince everyone within the company that the best long-term strategy is to look after the customer. Slowly but surely, I was able to change this mentality and put the customer at the heart of everything. I’m really pleased to say we now have a good balance of the two and we always put the customer first. You’ve been nominated for – and won! – a number of professional and industry awards. How has this kind of recognition impacted your career and personal confidence? Winning an award is like icing on the cake! It’s great to get the recognition when we’re working so hard! The two awards that mean the most to me personally are Investors In People Silver Accreditation, and the BFA award (British Franchise Association), as for Talk Direct this was the equivalent of an Oscar red carpet event! Our franchisor, O2, had nominated us for a customer service award and it was an emotional evening. We won the Special Judges Award, and Zak took Mark up with him on to the stage, and we received a standing ovation. Our amazing story has been such a success that O2 has asked us to help them with our training techniques so that they can reach out to even more customers - and it doesn’t stop there! For the past three years we have been focusing on helping visually impaired customers (which account for 1 in 30 people in the UK), and in the last few weeks we’ve also connected with the Doncaster Deaf Trust, and every “Guru” in our stores has undertaken the Deaf Awareness training course. These days everyone needs a mobile phone, and our objective is to offer a bespoke service for our customers to make technology accessible to everyone, irrelevant of their disability. 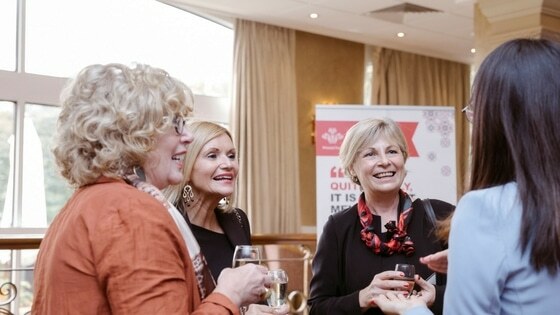 How can Talk Direct’s services help Forward Ladies members to grow their businesses? As well as selling to individual customers in our high street shops, behind the scenes I’m currently creating our business to business department. We work with all SMEs (everyone uses a mobile phone! ), and whether or not you’re happy with your current supplier, you can find out how we benchmark against what you’re currently paying - even if you’re not due for renewal yet. It’s never too soon to have a conversation about your requirements! Building a strong local business community is important to me – and Talk Direct’s new business to business department is all about helping each other and working together.